This hand blown glass fluted bowl is from Dirwood's "End Of Day Glass®" series. It contains shades of red, orange, pink, green, yellow, blue, gold and many more colors of the rainbow. 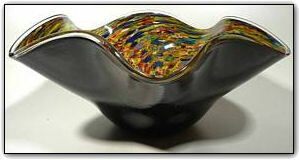 The outside of this piece is a glossy black and an elegant clear glass lip wrap surrounds the top lip of the bowl. This bowl also has a handful of gold aventurine added to the inside color mix to create sparkles throughout the piece. The more light you shine on this piece, the more it will sparkle!